You know how I basically never ever actually "finished" our nursery room for Ella because when I was pregnant I made really poor decorating decisions and couldn't be trusted? But I tried anyway? Well guess what, I still don't like it. But it has changed quite a lot and after a whole year of vaguely mentioning this (during my umm about 4 posts that I wrote in that time) I thought I may as well share some photos. The paint colour is still a very stark stark white which looked amazing in all the Pinterest rooms I admired... but Pinterest deceived me because it neglected to mention, that stark white looks awful if you are pairing it with, say, all your white furniture which now turns out to be not actually pure white and everything looks dirty, like a smoker baby lives there. These are not After photos. Just saying. I'm actually still gathering my energy to change a few things e.g. paint and curtains. I bought blackout curtains which saved my life but they are so thick and rubbery and greyish even tho I thought they were pure white, too. 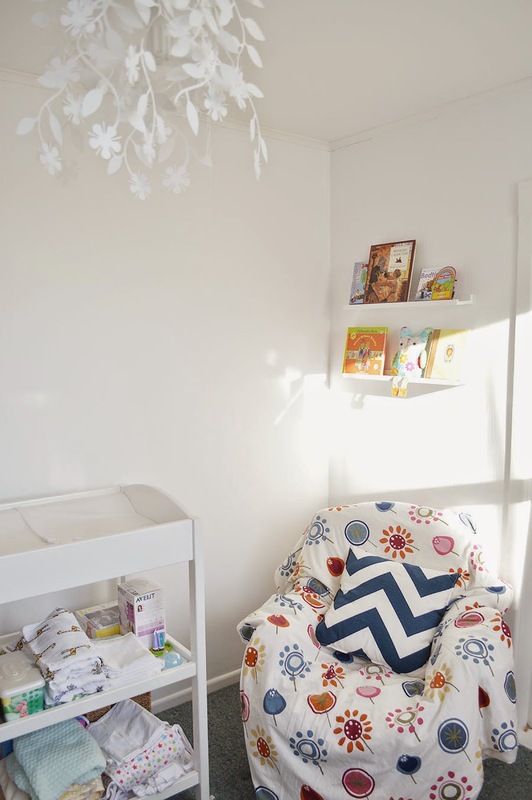 But can anyone tell me how you repaint a room when there is a 1 year old sleeping in there several times a day? Hmm. cream rug which doesn't look great in photos but actually it makes the room seem so much bigger. 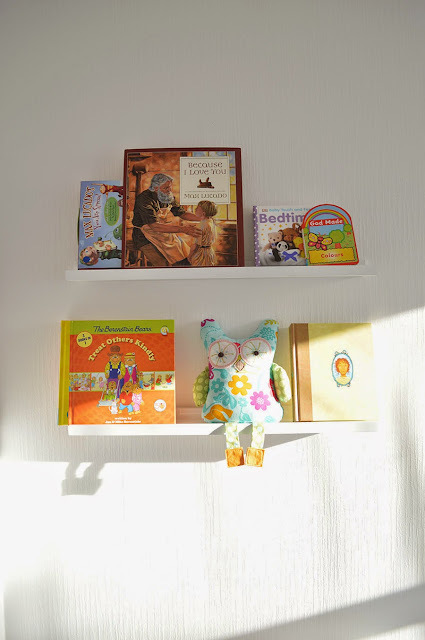 This room is super super bright in the sun and looks kind of ethereal at times - it can be gorgeous in person but clearly my photography skills are failing to show that. Random dining chair with a quilt over it because I soon realised my child sleeps in a merino sleep sack and all the quilts and blankets don't get used. Also, it covers the big rips in the chair upholstery. I use that chair to sit on in the middle of the night when I'm rocking a sick baby. Again another average photo that doesn't really show any improvement - maybe because there isn't any - but the original wall art was old and had a yellowing background which looked pretty gross against the stark white walls. So I pinned a tea towel there instead, naturally. 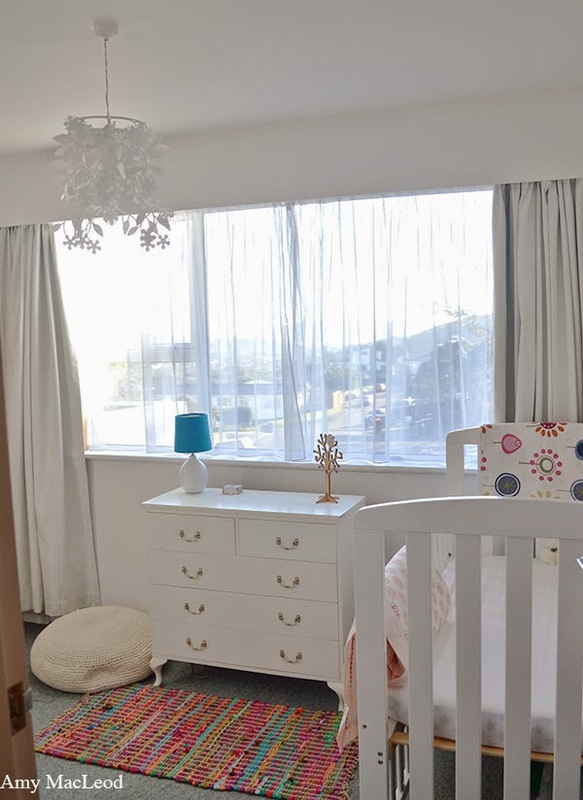 Oh and Wellington ladies with babies - any tips for earthquake-friendly wall decor that can go above cots? No way am I hanging pictures or anything remotely heavy there now that she sleeps in this room. ....and the same corner now, below. We don't read to Ella in this room so the books are in the lounge, and the armchair has been gone since my breastfeeding days ended so long ago. I do love the extra space and organised changing tables make me happy. P.S how long does one use a changing table for a baby or toddler????? And finally, some more current shots. I have to include the wardrobe one because baby wardrobes, once they are past the onesie-and-nighties-all-day phase, are my favourite. 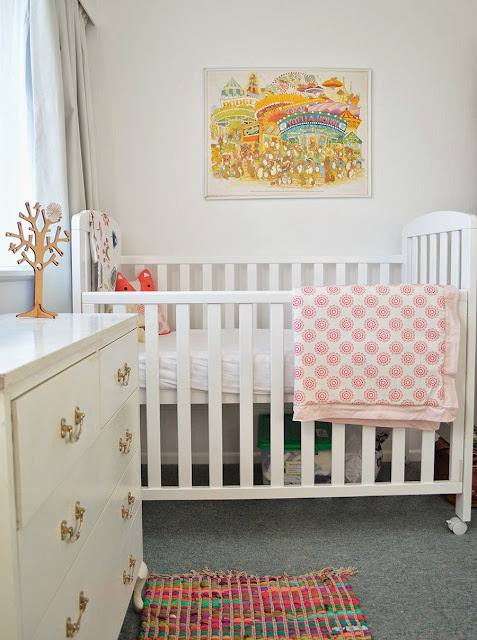 Anyone else find they never really finished their nursery? I've accepted that this will probably never be our 'dream house' and there are plenty of things I would like to change but am never going to. Having said that, a few simple changes could make this room quite pretty. I just haven't figured out the logistics of painting a room with a baby on the loose... yet.